Boosting The Search For Nature's Building Blocks : 13.7: Cosmos And Culture CERN has said that the Linac 4 booster for the Large Hadron Collider is ready. The hope is that with higher speed and luminosity, unknown particles may be found, says astrophysicist Marcelo Gleiser. Part of the Linac 4 booster at CERN, as seen on May 9 in Meyrin, near Geneva. 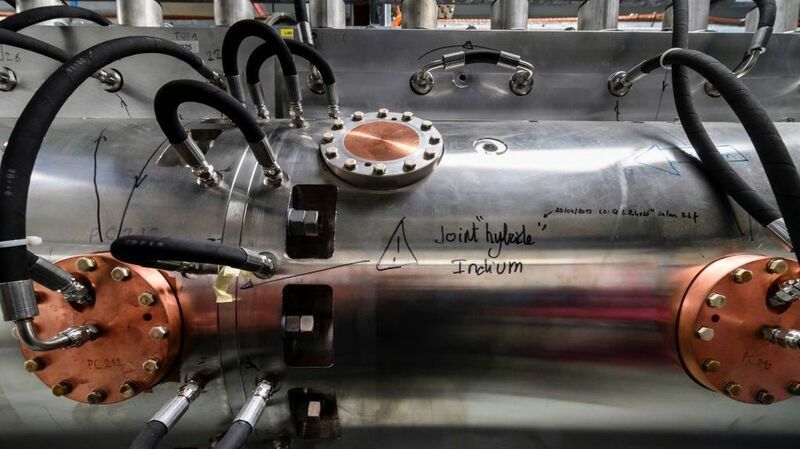 The booster will allow the LHC to reach higher luminosity in the next few years. When it comes to particle physics — the branch of physics that tries to find nature's fundamental building blocks of matter — it's all about energy and momentum. Moving (or kinetic) energy, to be precise. The higher the speeds of the particles, the more violent their collisions. Well, we are trying to "see" things that are millions of times smaller than atomic nuclei. And we can't just keep cutting matter down to find its smallest pieces. So, it's like if I ask you to find out what's inside an orange without cutting it. What would you do? Either throw an orange against the wall, or throw it against an obstacle. As the pieces fly off, you can reconstruct the innards of the fruit. Particle collisions do essentially the same thing, but with a major caveat. Energy can transform into matter. It is as if you throw an orange against the wall and out flies a watermelon. Or something unexpected, like a new exotic fruit (particle of nature). Due to the laws of relativity and quantum physics, an amazing transmutation happens as the energies of the moving particles climb above a certain threshold and they collide: As described in the E=mc2 formula, the energy of motion becomes new particles. The game of particle physics is then to increase as much as possible the energy of the collisions so as to "make" heavier and heavier particles, hopefully some of them new. An accelerator plays the role of the throwing arm: the more powerful, the higher the speeds of the particles and hence their colliding energy. These days, the frontiers of high-energy physics research are at CERN, the European laboratory for particle physics, and its huge particle accelerator, the Large Hadron Collider, or LHC. In July 2012, the LHC gave us the Higgs boson. Expectations are high that there is more to find: Could new particles of nature be lurking beyond current collision energies? We can only find out if we look; and to look, collision energies need to be increased. After 10 years of hard work, Linac 4, the new booster for the LHC, is ready. The announcement was made last week at the European laboratory's headquarters near Geneva, Switzerland. A booster is an initiator of the long chain of events and machines designed to inject particles into the 17-mile-long circular tunnels where they are accelerated in clockwise and counter-clockwise directions to near the speed of light before colliding into one another. Like a sprinter with a head-start, the more powerful the booster, the higher the speeds the particles can reach. Linac 4 will replace Linac 2, which has been working since 1978, and will reach energies three times as large. But not only energy counts here; there is also something called luminosity, which essentially means how many protons are bunched together as they move along the tunnels. The higher the luminosity, the more protons in a bundle and the higher the probability that two or more will collide. When Linac 4 is operational, around 2020, the expected luminosity increase will provide new windows into the Higgs boson and, hopefully, new physics. By 2025, with further upgrades of the LHC, the luminosity should increase by a factor of five. What lurks beyond the current visibility limits no one knows. As the 6th century BC Greek philosopher Heraclitus is credited as saying: "Nature loves to hide." And we humans love to find. There are theoretical models and expectations, of course but, in the end, nature decides. More than the discovery of a predicted particle, it's the unexpected surprise that makes for even more exciting news. Right now, the physics community is somewhat stunned by how hard it's been to find the so-called dark matter particles, which presumably comprise some 27 percent of the matter filling the universe — a factor of five more than the stuff we are made of. Dark matter only acts on ordinary matter gravitationally, making it quite hard to find. Direct searches (collecting particles that fall down from the skies, literally) has so far failed, leaving the production of a dark matter particle in the laboratory, possibly the LHC, as a hoped-for breakthrough. Time will tell if the search is successful. Meanwhile, we celebrate CERN's achievement, hoping that nature will throw us a few breadcrumbs along the way.